Intricately designed Kabbalah amulet to be worn against the Evil Eye, made of Sterling Silver by Dan Design. This is the amulet to get if you feel the wearer could use protection against the Evil Eye. Made of Sterling silver, it is an elegant and unique piece of Jewelry. According to Kabbalah, Judaism's mystical tradition, the Evil Eye (Ayin Hara in Hebrew) is a very powerful negative force. When people look at us jealously or out of malice, their gaze can affect us, keeping us from realizing our full potential - thus possibly bringing on the Evil Eye. This rectangular Sterling silver amulet is hung on its own sterling silver necklace with two hooks which form part of the design. The background of the amulet is an almost smooth surface, pitted with tiny marks to give it a matt feeling. The letters (Alef, Lamed, Daled), shaped in the classing shape of lettering in the holy Torah Scroll, are left in relief, with a deeply etched surrounding area in a rectangular shape. In Kabbalah, this letter sequence is commonly used as a tool to help ward off the evil eye, alone or in conjunction with other symbols. A small round turquoise stone is set between the first and second letters. Blue and its variations have long been used in the Middle East and around the Mediterranean to ward off the evil eye. 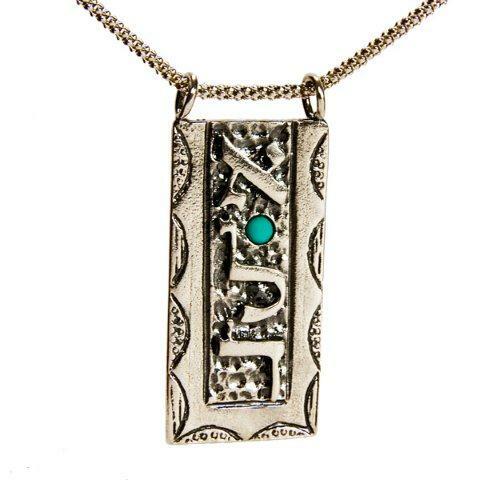 An arch motif is etched repeatedly around the sides and bottom of the amulet, adding more visual interest.This sterling silver amulet from Israeli Jewelry designer Dan Designs measures.7 inch x 1.4 inch (18 mm x 35 mm). Kabbalah warns that one should never underestimate the negative influence of the Evil Eye. People need to take steps to combat it. Anyone who fails to protect themselves could eventually become a victim. Get this amulet to help symbolize to the wearer that protection can be available.